At least they’d had the foresight to include photographs of all the dishes on the menu! Thanks, raised a smile for a few minutes in my working day. This is great–I love the explanation behind them, not just laughing at them. My favorite Chinglish sign from Beijing was a restaurant called “Meat Patty Explode the Stomach,” which you explain at least part of here. Thanks! The confusion between “noodles” and “face” is an artifact of the character “simplifications” after the revolution. The traditional character for noodles, still used in Japan, Taiwan, and (I believe) in Hong Kong and by the Chinese diaspora, is 麺. The right hand part is 面 and indicates the pronunciation, “mian” in Chinese, “men” in Japanese, and the left hand part is the character 麥 which is used in naming many grains. The “simplification” eliminated the left hand part of the character thus creating the confusion. So if someone had a bowl of noodles thrown in his face, he might say something in Chinese which could be translated as “my noodles are covered with noodles” or “my face is covered by face”. The simplifications are inconsistent because there are characters such as 缅, 腼, and 湎 which contain 面 and are pronounced “mian” but which have not been reduced to 面.
Harvey – you’re totally correct on the simplifications, but wouldn’t 臉 be more likely, at least in colloquial speech, to be used for ‘face’ than 面? 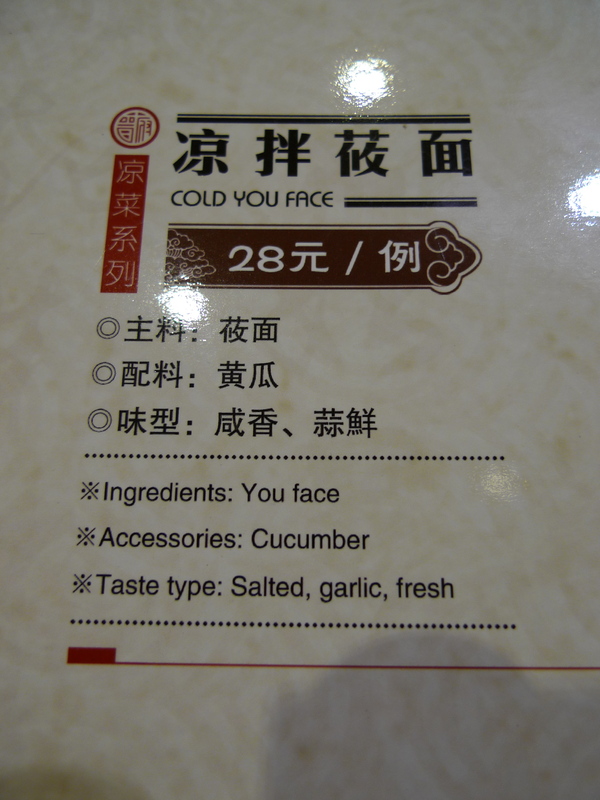 The latter strikes me as more literary and terms like 面子 aren’t really used to describe physical faces. Language Log wrote up this post: http://languagelog.ldc.upenn.edu/nll/?p=8108. “Hong” seems to be the Cantonese romanization of the third character, as in “Hong Kong,” but I don’t know why they’ve used both Pinyin and Cantonese.